As I mentioned in my last post or the final reveal of our new living room… I’m not done my creative re-decorating rampage! One may think I’m pregnant and nesting with the way this is going… but no worries! I’m not! I had the bright idea of taking on our master bedroom next. Our room is functional, but not beautiful or as welcoming as I would like. I want our room to be an oasis. A place of rest and peace and beauty. AND I want to transform it for free or make money off of it. So lets get started and see what we can do! I’ve already started on the free aspect… Three new pieces of furniture have been obtained and all need work! As of now I’ve completed two, but dear hubby is going to work on the third, so it proabably won’t get done anytime soon! The first is a new side table. I found this one on the side of the road in a trash heap. It was cute, so I grabbed it! It’s prety rickety and was VERY dirty. It took a lot of scrubbing to get all the dirt off of it, but I finally finished! Then I did a quick brush over with blue paint and that was it! I didn’t sand it or prime it or even put a second coat on it. 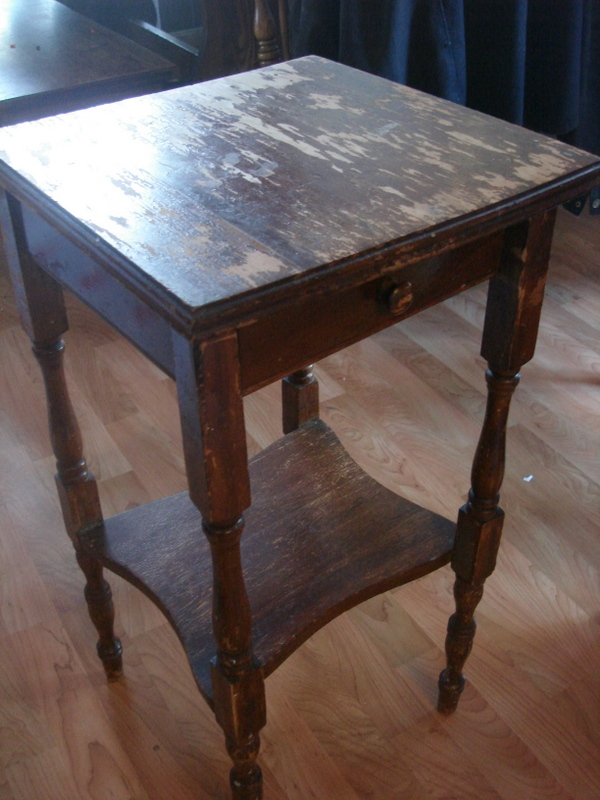 It is a bit streaky and the dark stain underneath shows through in spots, but it adds character and a vintage look to it! The drawer doesn’t hold a lot and it’s not super stable, but it’s perfect for next to the bed! Next was a dresser I found on freecycle. It was a “curb alert” meaning someone had it on the curb for the trash to come and remove it. There was no way I was going to make it into Burke before the trash arrived and I emailed the family and asked if they could just hold it for me one day and we would come get it. They pulled it to the top of the drive and Brian picked it up the next morning. Most of the drawers were coming apart and a few rails were broken. Brian fiixed all of them while I was painting the large dresser part an off white cream color. 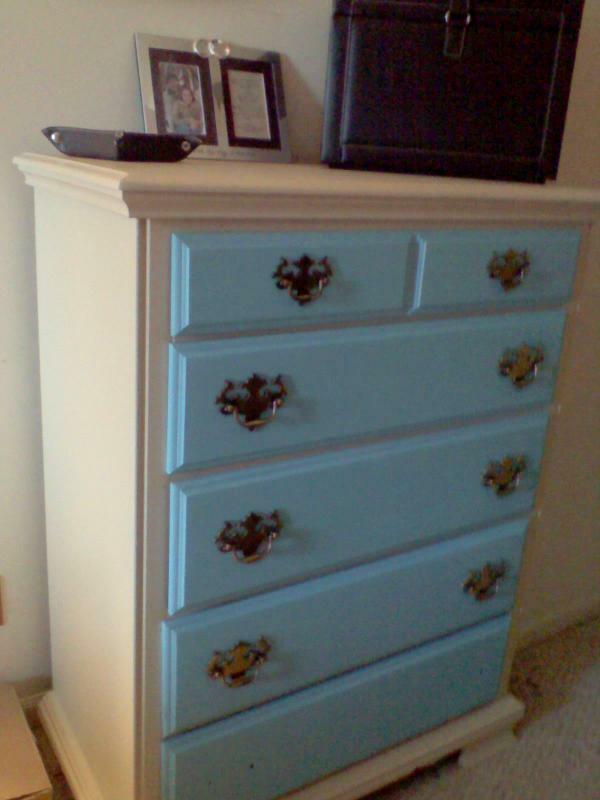 When he finished I painted the drawer faces my favorite shade of blue. 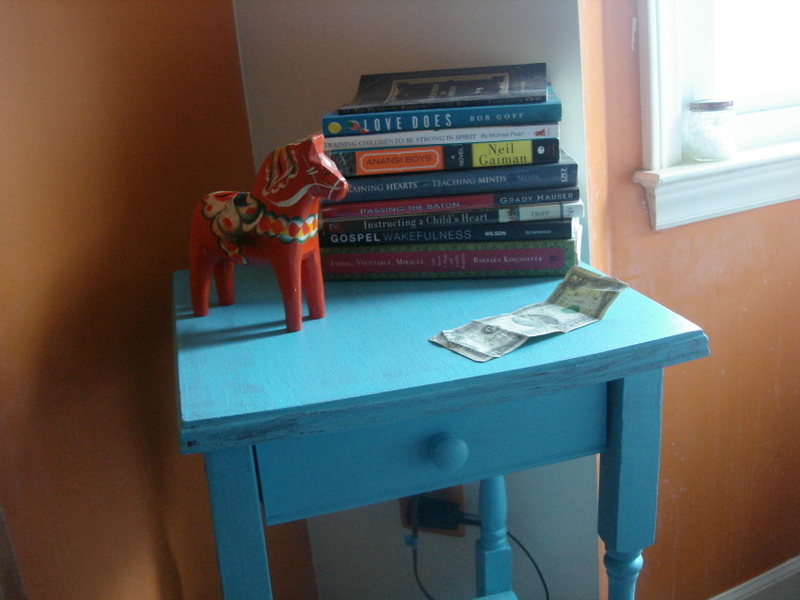 Once they were dry I reattached the drawer pulls and we had a beautiful new dresser. I actually took a photo and sent it to the lady who saved the dresser for me. Thanking her for it and showing her we were giving it a new life! She was delighted! She also said the dresser was hers when she was a little girl and was having a hard time getting rid of it, but it didn’t match their decorating style anymore and all the drawers were broken. She was glad it was repared and loved! And the last addition is one of my favorites! The wardrobe! My grandmother send out an email about a year ago to the family asking if anyone wanted it. I of course couldn’t pass it up and thankfully I didn’t have to fight anyone for it! We finally were able to go visit Mim and Pap and pick it up. It’s SOLID wood and heavy and falling apart! It’s just loose and looks as though it’s been fixed a few times. We were able to get it home in one piece and up in our room with lots of manly brawn borrowed from a few friends! Sometimes the story behind furniture is the most beautiful part. This piece belonged to my grandmother’s grandparents. She said it was purchased in the early to mid 1800s. All the wood working on it had to have been done by hand! And it was probably trandported to their home in a horse drawn wagon. If only it could speak! I’d love to heard it’s stories! 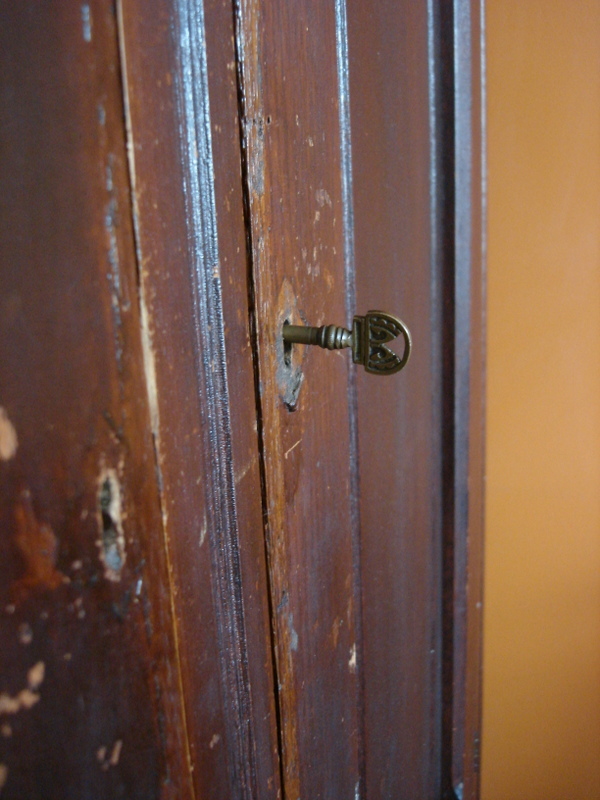 Also the original key is still with it, and there are no latches, it just locks to hold the doors shut. 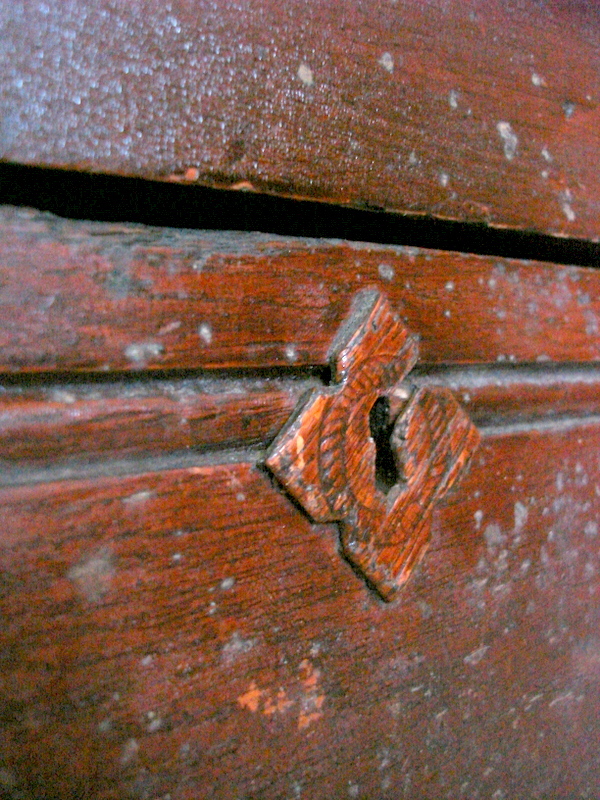 Around each key hole instead of brass plate there is a pice of wood that is carved around the key hole. It is such a special piece to get to have! There is trim work that goes around the top, but it had been removed to fit in my grandmother basement and in the process it was cracked. Brian is going to try and re-attach it, but it just hasn’t happened yet! I’m sure he will get to it sometime!… Hopefully sooner rather than later! So there you are! Three new pieces to change the decor in our room! It’s coming along! 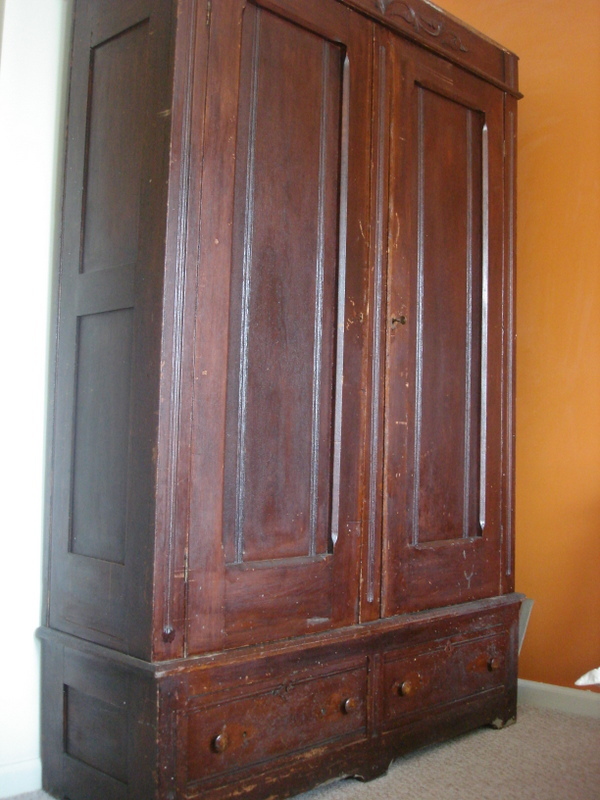 So do you have any furniture in your home that had a special story? I’d love to hear it! Beautiful! I love furniture with a story.